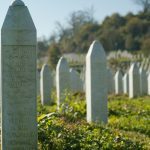 Remembering Srebrenica has taken key influencers from diverse backgrounds to Srebrenica to learn from the genocide and victims’ lives, before returning to the UK to take action in their communities. We also work with people who help us to keep the memory of the genocide alive. Here some of those individuals reflect upon their experiences. A group of students and academics from the University of Bedfordshire and other UK universities travelled to Bosnia & Herzegovina on our 'Lessons from Srebrenica' programme of educational visits. In early November 2015, a group of individuals from the UK visited Srebrenica on our educational visits programme. They heard inspiring stories of survival and first-hand accounts from those who lived through the war. Delegate Zeenat Islam blogged about the experience and has kindly allowed us to publish the extracts below. A group of young professionals from the Emerald Network travelled to Bosnia & Herzegovina with our 'Lessons from Srebrenica' educational visits programme to witness at first-hand the testimony of survivors and Mothers who lost loved ones in the Srebrenica genocide. British Army officer Major Jerome Kenyon took part in our 'Lessons from Srebrenica' educational visits programme, as part of a delegation of Ministry of Defence personnel. He wrote the following article about his visit for the Honourable Artillery Company Journal. A group of young artists, writers and musicians from East London travelled to Bosnia & Herzegovina with our 'Lessons from Srebrenica' educational visits programme to witness at first-hand the testimony of survivors and Mothers who lost loved ones in the Srebrenica genocide. A short story from Kerim Iković, who was inspired to write it as he felt people rarely talk about the essence of victims’ souls and the fact that they had a past, but no future. Kerim works as an Accounting Officer in Sarajevo, Bosnia & Herzegovina, where he lives with his wife and two children. In September 2015, high-profile figures from Scottish public life travelled to Bosnia & Herzegovina with our 'Lessons from Srebrenica' educational visits programme to witness at first-hand the testimony of survivors and Mothers who lost loved ones in the Srebrenica genocide. A group of young people from Manchester travelled to Bosnia & Herzegovina with our 'Lessons from Srebrenica' educational visits programme to witness at first-hand the testimony of survivors and Mothers who lost loved ones in the Srebrenica genocide.